This graphic from Ted Slampyak and The Art of Manliness show you how to do the three most popular climbing techniques. There's the basic gym class technique that you've probably done before, the S-Wrap technique that's used by the U.S. Marines, and lastly the BUD/S technique used by the U.S. Navy SEALs. Try all three and see which feels the most comfortable for you, then practice, practice, practice. I feel that by including the artwork from artofmanliness you are ripping off their work. The "gym class" technique is next to useless - just don't bother. And the "marines" one drops too much speed for stability. The "seals" one or variations on is the best compromise. 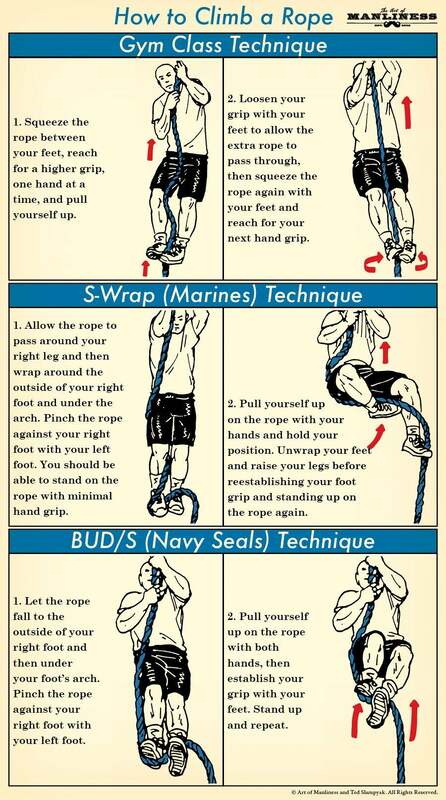 One trick with it is to effectively squat up the rope to avoid over-fatiguing arms/grip. Though for a serious challenge, try a rope climb without using your feet at all.